I love the Indiana Jones movies and I’m very anxiously awaiting the release of the next movie in the franchise. I’m even excited to get the new LEGO Indiana Jones game for the XBox 360 later in the year. But in the meantime, I can satiate my desire for the perfect combination of Indiana Jones and LEGO by picking up one of these awesome Indiana Jones LEGO sets over at the LEGO Shop. 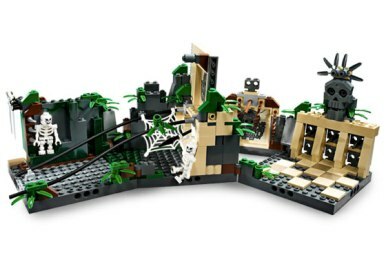 Recreating classic Indiana Jones scenes from Raiders of the Lost Ark and Indiana Jones and the Last Crusade, you can pick from 5 different sets to fulfill your inner LEGO nerd. The Indiana Jones and the Lost Tomb set shows the Well of Souls complete with the Ark of the Covenant. Sadly, there’s no Marion or Sallah or snakes. Asps. Very dangerous. You go first. For $19.99 you can’t ask for more. Race for the Stolen Treasure includes the car and truck from Raider’s road chase. Also a low price, and not a lot of complexity: $29.99. Temple Escape is the best one of the lot and sightly more complex. $59.99 to reproduce the gold idol temple from the beginning of Raiders, even with a mini-Alfred Molina. While all the rest are available now, the Temple will ship in February. Indiana Jones Motorcycle Chase gives you all the elements to reproduce the joust in the Last Crusade. And even while it’s the cheapest set, at $9.99, the included Henry Jones minifig makes it priceless. The fifth set includes all of the above sets in one package for $114.99 (a savings of $4.97 over buying them separately). Some of the sets are already on backorder, so make sure you get your sets soon!